Prefer to talk in person? No problem, stop by our shop at 11039 E Colonial Drive, Suite E, Orlando, FL 32817. Our shop hours are Tue-Fri 9-6 Sat 9-4; Closed Sunday & Monday. You can also reach us at (407)277-6247. 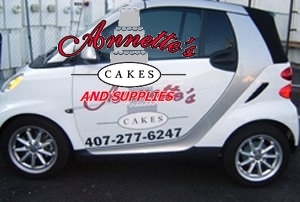 Watch for Annette delivering cakes in her decorated Smart Fortwo. This thing actually fits cakes that serve over 100 persons!